Two party animals-turned-mechanical-engineers named William Heimsoth and Aaron Attebery may have just changed the beer pong landscape with these new hexagonal additions to the game. By giving the cups their hexagonal shape, Heimsoth and Attebery have successfully eliminated any wasted space that came from the tiny voids between the round cups. Even beyond the new and improved functionality of these cups, their aesthetic presentation alone is enough to warrant a purchase. There's just something so satisfying about things fitting perfectly into other things. 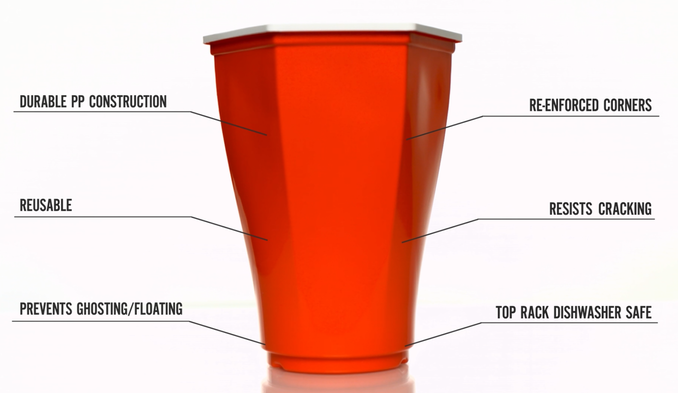 The cups are also hydrodynamic in design, preventing them from sliding around all over the table when you inevitably play that one guy who has no arc and fires lasers directly at the cups. Heimsoth and Attebery made sure to not only design the cups to create perfect, efficient shapes and racks, but to also serve other highly valuable functions. They're washable and reusable, making the $15 price tag a lot more understandable and reasonable. The Hexcups boast a patent pending mold made with stronger, reinforced plastic. So when that laser-shooting dickhead starts smacking cups off the table because he lost, you won't have to worry about random cracks in the cups. 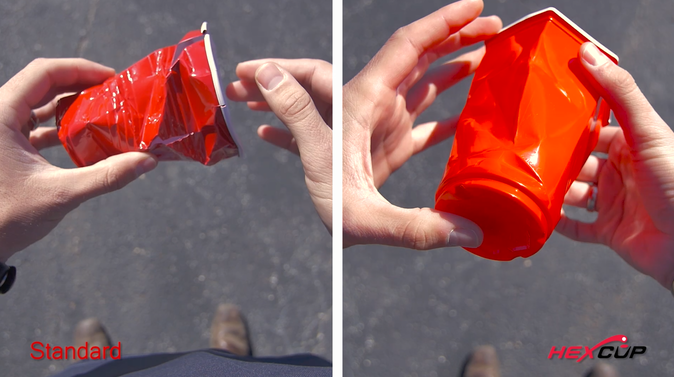 Even if the Hexcups are bent, they can be popped back into place, assuming the damage is mostly on the surface. The image below shows the damage that occurred after clearly rolling over each cup with a car. Pretty cool, huh? Being the undisputed beer pong champion that I am, I can say that I look forward to decimating my enemies with these cups. So what do you say, nerds? Any challengers?